Share a nighttime stroll down cobblestone streets with the charismatic Gentleman Bat. Abraham Schroeder is an artist, designer, and writer currently living in Petaluma, California, with his wife and son, after residing in a dozen other places, including Massachusetts, Alaska, and Japan. He likes bats and Japanese art. To read Abraham's in-depth profile, click here. Piotr Parda grew up in Nowy Targ, a town in Poland, and now lives in Somerville, Massachusetts. He has always enjoyed strange creatures and cartoon characters, and has illustrated over thirty books in Poland and the US. His artwork includes drawing, painting, sculpture, and moving images. He also likes bats and sometimes sleeps upside down. To read Piotr's in-depth profile, click here. Piotr and Abraham met in 2002 when they were attending the Master of Fine Arts program at the School of the Museum of Fine Arts, Boston. Some years later, Abraham was working at the Museum of Fine Arts, cataloging the museum’s spectacular collection of Japanese prints, and found among them an 1880s-era woodblock print of bats by Tsukioka Yoshitoshi, which became the seed of inspiration that grew into The Gentleman Bat. Keep an eye out, and you might find the image hiding inside the story. "The Gentleman Bat" is a fantastically illustrated foray into a nighttime stroll with an impeccable gentleman bat. Gently cadenced couplets of narrative verse describe the Victorian autumn evening setting of a London-like gentleman bat on a stroll to meet a lady bat who is a good friend. Touches of sly humor abound in both verse and picture, all in shades of gray with little glimmers of light. For example, a bespectacled vendor bat offers ear plugs for sale where the band will begin to play. The bat band play their instruments hanging upside down, while the gentleman bat and his lady friend dance in spats, suit, and hoopskirts, complete with batwings. When the evening drizzle progresses to a sinister, thundering downpour, the gentleman bat flourishes a clever, exotic, carved, teak cane that converts to an umbrella, protecting her fancy feathered hat and his silk top hat. Kissing the lady bat's cheek goodnight after their evening stroll in the rain, he returns to his cozy gentleman's home, closes the drapes to keep out the dawn, and goes to sleep upside down in bat pajamas. 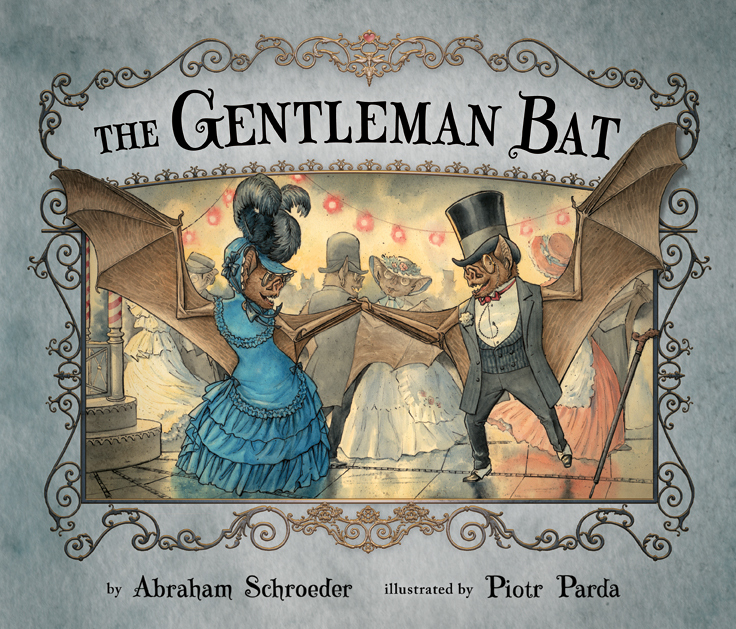 Children will be entranced with the lavish detail and vision of "The Gentleman Bat," a period fantasy children's book with a few funny twists cleverly integrated in both picture and verse. "The Gentleman Bat" is a treat to read for children ages 3-7. Stroll down the cobblestone streets with the Gentleman Bat as he courts a young lady (bat lady, of course!). The rhyming text moves the reader along as the two bat friends wander the cobblestone streets under night skies with lovely light emanating from shop windows and oil lit lamps. The wordless spread in the middle of their walk depicts all the bats dancing around the bandstand in all their fine Victorian garb. All is well until... "Without any warning came cause for concern: The sky took a sinister, foreboding turn." The Gentleman Bat, true to his name, protects his lady friends' feathered bonnet with his clever cane-turned-umbrella. By nights end, after the storm, they share a kiss and head their separate ways. Parda's illustrations are lovely and moody, expertly filling the dark sky with fog, mist, heavy rain and glowing light. The mat cover and moody blue end papers wrap up the package nicely. A dapper bat, resplendent in top hat, monocle and cane, strolls down 19th-century cobblestone streets to see where the night takes him. Inspired by a real-life Japanese woodblock print by Tsukioka Yoshitoshi showcasing bats and an umbrella (find the image tucked away in the illustrations), Parda and Schroeder create a debonair bat who hits the town of Batford. Upon meeting a lady bat friend in the town’s square, he asks her to dance (“A gentleman’s way to kindle romance”). They continue their walk, but rain threatens to ruin their evening. Luckily, he has an umbrella hidden in his cane. It’s an odd plot to be sure, but it’s absolutely charming in detail. Parda’s moonlit watercolors bring the Victorian era to life. Compact, wrinkled bat faces and webbed wings are folded into beautiful bonnets and full hoop skirts. Hidden jokes add to the fun. Sign posts advertise delectable drinks of coffee, nectar and plasma, while a corner merchant sells ear plugs (sure to make a bat’s evening more enjoyable). True to his eponym, the gentleman bat escorts the lady bat home, giving her a small kiss on the cheek at the gate. The Gentleman Bat is a spectacular debut for picture book publisher Ripple Grove Press. From the amazing front cover all the way to the satisfying conclusion, I was completely mesmerized and drawn into a bygone era filled not with people, but with gentleman and lady bats. The text is fluid, fun, and fantastic to read, and is complemented by beautiful watercolor and ink illustrations. Join the gentleman bat as he takes a stroll along cobblestone streets dressed in his finest attire and ready for a night on the town. went out for a walk one night in the rain. He meets his lady friend and the two head to the town square where a band is playing. She accepts his offer to dance. she giggled and laughed and kicked up her toe. Could there be a romance brewing? and made his way back to his house where he started. The Gentleman Bat is a lovely story that will entrance both children and adults. And if you are not a fan of bats, this picture book just may change the way you feel about the oft-misunderstood creature of the night. The Gentleman Bat is available for pre-order now and is due out October 1. Congratulations Ripple Grove Press!